How do I delete a course as an instructor? Once you delete a course, the course will be completely removed from your institution's account and will not be viewable by you, prior students, or the account administrator. We do not recommend deleting courses, especially if the course contains content and student data because you may need to access that information a later date. If you only want to remove the course from Courses & Groups in the Global Navigation, you can change the course end date, or if you have permission, conclude your course instead. Before you delete your course, make sure you have a record of your Course ID number. Administrators can restore deleted courses if they know the Course ID number. You can locate your Course ID number at the end of your course URL (i.e. canvas.instructure.com/courses/XXXXXX). Deleting a course is a course permission for manually created courses only. 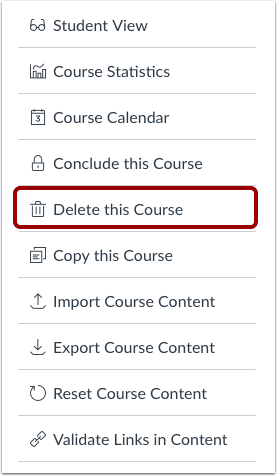 If the Permanently Delete this Course button does not appear in Course Settings and your course was not generated through a student information system (SIS), this setting has been restricted for your course. If you are an instructor, contact your admin for assistance. Courses are not deleted from an account unless done so by you or another user at your institution. Click the Delete this Course link. Note: Deleting a course is a permission enabled by your admin. If you do not see this button, you do not have permission to delete your course. Click the Delete Course button. Note: Before you delete your course, make sure you have a record of your Course ID number. Administrators can restore deleted courses if they know the Course ID number. You can locate your Course ID number at the end of your course URL (i.e. canvas.instructure.com/courses/XXXXXX). 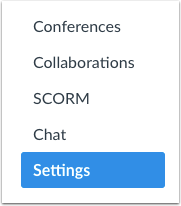 Previous Topic:How do I start a new course from the Dashboard as an instructor? Next Topic:How do I add a section to a course as an instructor? Table of Contents > Courses and Sections > How do I delete a course as an instructor? Re: How do I delete a course? Re: How do I delete a class?